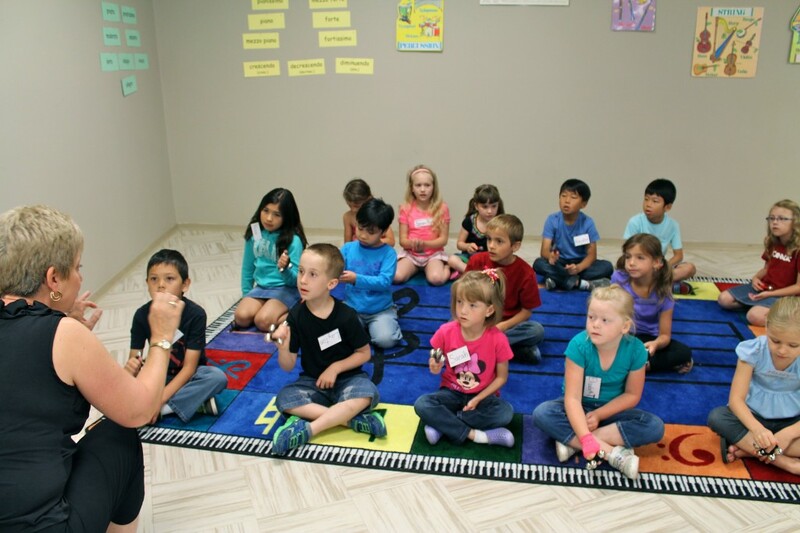 When you have an activity using non-pitched percussion or rhythm instruments, it can get noisy and out of control if your children don’t know or don’t follow your procedures. When giving out instruments, I explain to the class that I’m going to put the instrument on the floor in front of them and they are to wait until everyone has an instrument and I tell them it’s OK to pick up and play. The analogy I use is if you go to a fancy restaurant, you don’t start gobbling your food the second it’s placed in front of you. It’s polite to wait until everyone has their meal, and then you all start eating at the same time. The kids are very quickly engaged in the activity, they are exploring ways to play the instrument, and there is no chaos! When that activity is finished, and they have to wait until the next activity is prepared, the rule is: If you play before I say I’ll take your instrument away. I will take away an instrument, but usually give it back for a second try. Certainly, the behaviour is better from all the students if I do take away one instrument. Remember Barbara Coloroso’s saying: Say what you mean (If you play before I say I’ll take your instrument away. ), Mean what you say and do what you say! There are many ideas for using rhythm instruments in the new collection, Rhythm Instrument Fun. Get more information on the collection at www.musicplcay.ca. This entry was posted in Rhythm Instrument Ideas and tagged Denise Gagne, fun ideas for egg shakers, Fun ideas for rhythm instruments, fun ways to play rhythm sticks, Musicplay, rhythm band, rhythm instrument activities, rhythm instrument ideas, rhythm instruments on August 2, 2013 by Denise Gagne. I got an email from a teacher who is going to Cambodia to work with children. I’m going to be teaching a workshop in Cambodia in a couple weeks for Friends International. They have about 5 foreigners who head up cultural activities and care for the children that they support. They have asked me to do a half day workshop on making instruments from recycled materials and then some songs and activities they can do. Do you have any great resources for this? I would definitely like to pull a few songs from the “Singing Games Kids Love” books, but other than playing along to recordings and soundscapes, I’m a bit stumped for good ideas of what they can do with their homemade instruments. With older kids, I’d teach them some basic rhythms, and have them play a series of rhythm patterns with the music. 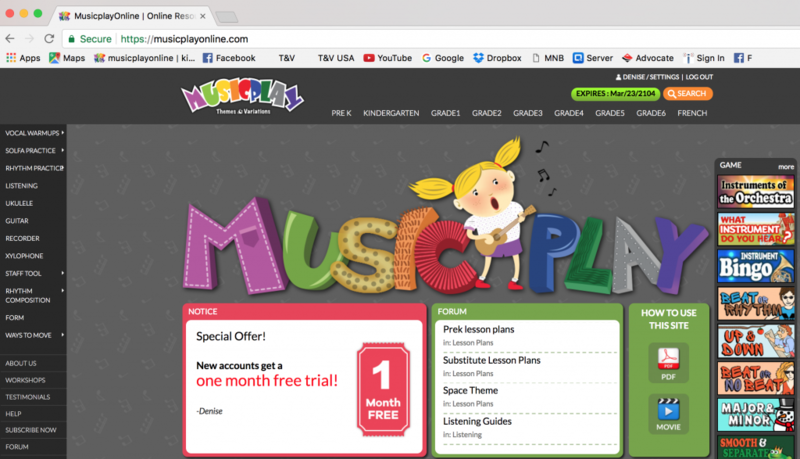 If you have the Listening Resource Kits, take a look at any of the instrument playalongs in them. With my littlest ones,we use only one instrument for all the things on the bus. With older kids, I’d choose instruments that fit the sounds of money, or doors opening and shutting. Use body percussion as well – doesn’t have to be instruments. I’d like to write some stories for kids to add sound effects to – I need some that my littlest (3 year olds) could play with. If you have any brainstorms let me know! 4. Older kids love the Pop song play alongs. We’re working on a publication, but it will be a few months. – create 4 bar rhythm and add an ostinato. Put the ostinato on one instrument, and have the rest play the rhythm. 6. Check the lesson plan section of the blog for more ideas. 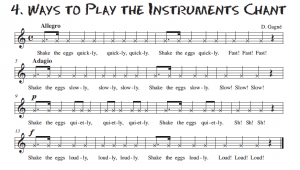 This entry was posted in Rhythm Instrument Ideas and tagged add instruments to story books, Denise Gagne, instrument lesson plan ideas, rhythm instrument ideas, rhythm instruments lesson plans on January 25, 2013 by Denise Gagne.